As the name suggests, branching is nothing but bifurcation of the survey path. Participants will be redirected to certain pages in the survey based on the answer options they select. By keeping participants focused on what matters to them, they stay engaged throughout, making your data more meaningful and your participation rates higher. SoGoSurvey offers two types – Simple Branching, which sets a participant’s path based on a single answer, and Advanced Branching, which bases the path on multiple conditions. End Survey options also provide additional strategies to deal with participants who have answered all relevant questions and should be exited early. This option directs participants from page to page based on a specific answer. Branching can only be completed from page to page, and it is often useful to create a diagram to think through how you’d like your participants to move through the survey. 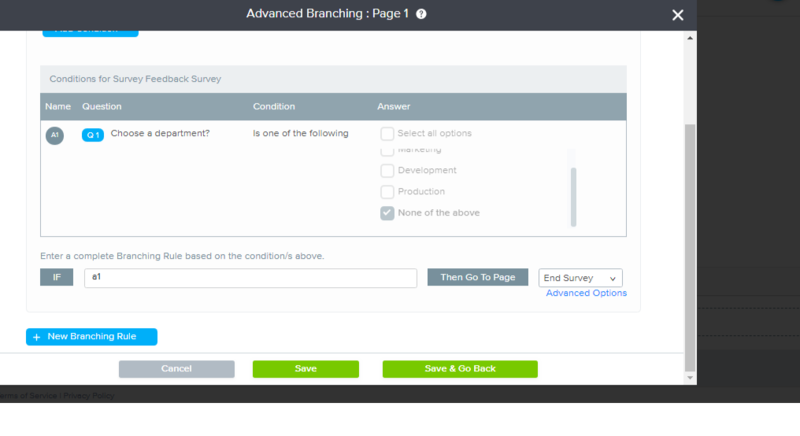 Branching helps simplify survey design by allowing you to simply avoid asking participants questions they cannot answer. For example: In an employee engagement survey, you might want to ask managers one set of questions and non-managers a different set. Simply ask (or pre-fill!) the answer to ‘Are you a manager? YES/NO’ and set a branching rule so that the right participants see the right questions! Once you are done adding questions and Descriptive Text to your survey, select the ‘decision’ question on which branching should be applied. Choose your question carefully. If participants bypass your chosen question due to another branching rule, you cannot send them back. Branching cannot be applied to a one-page survey or to the last page of your survey. Hover over the chosen question, then click on More and select Branching. For each answer option, use the dropdown menus to select the page to which participants who choose that answer should be directed. In other words: If Answer Option ___ is chosen, Branch to page ___. Once the required branching options are chosen, click Save. As needed, you may also expand the view for other pages and questions on which you would like to apply branching. This ability to focus on a very specific segment allows for powerfully precise feedback from exactly the right participants – leading to very high quality results. As with Simple Branching, consider sketching out a map for your participants. Whether it’s on a whiteboard or onscreen, it helps to have a plan! 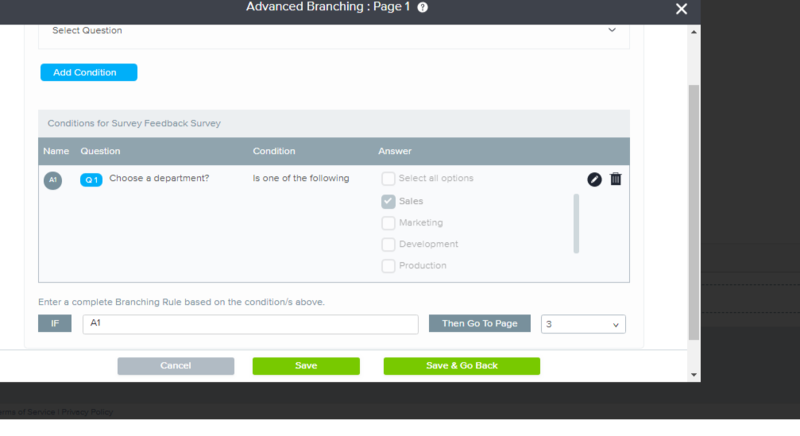 Once you are done adding questions and Descriptive Text to your survey, select the first ‘decision’ question on which branching should be applied. Choose your question carefully. If participants bypass your chosen question due to another branching rule, you cannot send them back. Hover over the chosen question, then click on More and select Branching. A pop-up window will appear, displaying all the questions of your survey. Click on the ‘Apply Advanced Branching’ button beside the page where you want to apply this feature. You will now see a window where you need to add rules and conditions for Advanced Branching. To set a rule, select the preferred question under the Select dropdown. You cannot apply Advanced Branching to a Descriptive Text. From the Select Condition dropdown, choose ‘Is one of the following,’ ‘Is not one of the following,’ or ‘Is not answered’. Once you select any one of these conditions, a set of answer options will be displayed. Select at least one of these answer options and click on the Add Condition button. This becomes one condition; i.e., A1 for one rule. Add one more condition by following the same steps. This becomes condition A2. Then, specify which page you want the participants to route to in the dropdown list beside ‘Then Go To Page’ section. Save your changes by clicking on the Save or the Save and Go Back button. Preview your survey to test your branching. If you need to delete a branching rule, click on the Delete icon in the top right-hand corner of the rule. Advanced Branching Rule 1: If participant selects Sales, then skip to Page 3 (which displays all sales-related questions). Advanced Branching Rule 2: If none of the options are selected, then end the survey. You can add up to 10 rules per page and 50 conditions per rule. This feature allows you to end the survey on a desired page when a participant arrives on that page. The page selected will be the last page of the survey for any participant who reaches it. This option is especially useful when a participant has completed all relevant survey questions, likely due to branching, and should be able to exit the survey rather than proceeding through remaining pages to the main Thank You page.